Wicked: The Untold Story of the Witches of Oz is Steven Schwartz and Winnie Holzman’s award-winning retelling of L. Frank Baum’s classic The Wonderful Wizard of Oz. Browse tickets below! Enter Promo Code SAVE at checkout for additional savings on Wicked tickets. Based on L. Frank Baum’s The Wonderful Wizard of Oz and Gregory Maguire’s 1995 novel, Wicked: The Life and Times of the Wicked Witch of the West, Wicked tells the story of the Ozian women Elphaba and Galinda – unlikely friends who go on to become the notorious Wicked Witch of the West and Good Witch of the South. One of the longest running musicals in the history of Broadway, the play debuted in San Francisco in 2003 before moving to New York later that year. 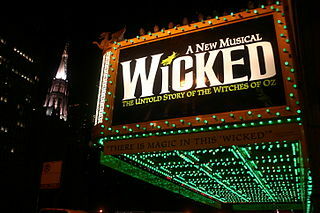 A U.S. tour followed shortly, and Wicked has been in continuous production on Broadway and elsewhere ever since. The Wicked’s enduring popularity has to do with the ways in which it attempts to humanize universally recognized characters from The Wizard of Oz. The Wicked Witch in particular is given depth and humanity that all audience members can identify with, and Winnie Holzman’s book uses this dynamic to explore themes of friendship, good and evil, conformity, discrimination, and more. Of course, Steven Schwartz’s amazing words and music helps also. Popular musical numbers from Wicked include, “Defying Gravity,” “Popular,” “The Wizard and I,” “No One Mourns the Wicked,” “Dear Old Shiz,” and others. The score is noted for its inventive use of musical themes and leitmotifs – a rarity in many Broadway musicals, but well in keeping with the play’s thematic devotion to reinventing tropes and subverting the familiar. Where can I find Wicked tickets online? The best place to buy Wicked tickets online is buyTickets.com buyTickets.com has amazing deals on even the most hard-to-find tickets, thanks to our partnership with ticket brokers across the country. If you can’t find the Wicked tickets you’re looking for here, they simply can’t be found. Are there promo codes available for Wicked tickets? Yes! buyTickets.com always offers promo codes on all of our events, so that our customers can save even more on our already great prices. You can find a promo code for Wicked tickets at the top of the page. Enter it at checkout by clicking the “Have a gift card or promo code?” button below the area for your credit card information and entering it into the field. Can I buy Wicked tickets by phone? I heard Wicked tickets are sold out. What can I do? You may be able to buy sold out Wicked at buyTickets.com. That’s because are tickets come from a network of trusted ticket resellers, so even if the venue is sold out there may be more for fans like you who care to look. Take a look at our selection above to find out for sure. That depends on the date, the venue, the current market on tickets, and more variables too numerous to go into here. The only way to know how much Wicked cost for certain is to find the event you’re interested in from the list above and take a look at the tickets currently on sale. Will Wicked tickets be cheaper on the day of the event? What if I have more questions about Wicked tickets?